For the past 69 days, the world has watched the story unfold. 33 Miners trapped! Well by the end of tonight, all the trapped miners should be freed. For some the families of these miners, this should be a wonderful night. Not for Marta Salinas and several other women. 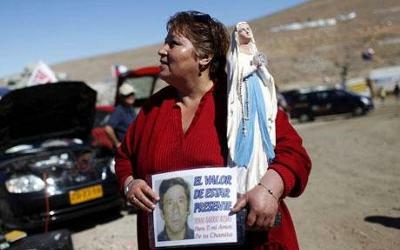 Marta Salinas, the spouse of miner Yonni Barrios Rojas, discovered her husband's mistress during a vigil for the miners. Marta and Rojas have been married for 20 years! Rojas was the 21st miner saved Tuesday, but his wife was not there to greet him. Most notable of the wives to find out about their men's mistresses is Marta Salinas, the spouse of miner Yonni Barrios Rojas, the 21st miner saved Tuesday. Rojas is the only one of the miners medically trained and has been using his knowledge to treat the first aid problems of those underground. While his medical know-how has been much appreciated, he will have some serious questions to answer. It is nice to hear that all the miners should make a full recovery physically, but will there marriages survive? This story does not have the happy ending for all!